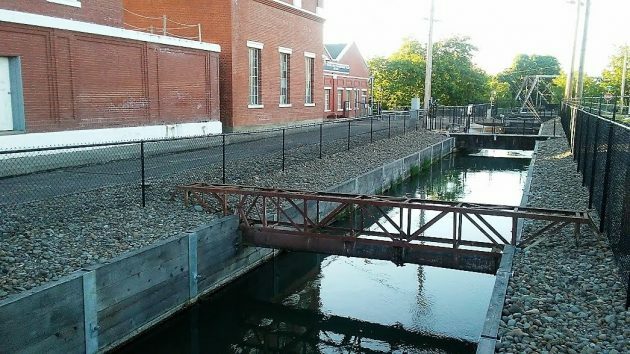 As expected, water in the Albany-Santiam Canal at the Vine Street treatment plant, shown on June 1, proved to be free of cyanotoxins. The great Salem water emergency has been over since Saturday. But as usual after such an event, we have to think about it and see what we can learn. What happened, in case you were out camping and missed it, was that there was a “bloom” last month in Detroit Lake, caused by a proliferation of cyanobacteria, also called blue-green algae. These algae produce four kinds of toxins that can make people sick, especially the very young. And dogs too, by the way. Salem gets its drinking water from the North Santiam and sampled for those toxins on May 23. Two days later the tests came back and showed elevated concentrations. They considered what to do. One thing they didn’t do was notify the public right way, not until issuing an alert on May 29. More samples were taken, and the alert was lifted on June 2. We all heard about the initial panic, caused in part by a screwed-up automated warning that went to people in Linn and Benton counties too. It called on people, without explaining anything, to “prepare for action.” Like what? Clear the decks? Battle stations? When the situation became clear, lots of people in Salem, and the mid-valley too, stripped store shelves of supplies of bottled water. Marion County asked other communities for help. On Friday, Albany sent two tankers full of water, one with 1,000 gallons and the other with 550) and was standing by to provide more if asked. In Albany, city officials didn’t see any reason for concern because the city’s water system, which also serves Millersburg and the Dumbeck Lane water district in North Albany, draws its supply from the South Santiam above Lebanon, via the Albany-Santiam Canal, and from the Santiam River a few hundred feet below where the North and South Santiam converge. The Oregon Health Authority asked Albany to test its water at the Albany-Millersburg treatment plant on the Santiam, off Scravel Hill. On its own, the city also had tests done on the South Santiam River, the Santiam Canal and the finished water coming out of the Vine Street plant. City Manager Peter Troedsson announced the Santiam results to the council on Friday. They showed a low level of one of the toxins in the river water but none — none — in the finished product coming out of the plant, which uses membranes to filter the water. The Vine Street results came back Monday. “There was no detection of cyanotoxin in the canal or in Vine Street water,” Troedsson told me. — Blue-green algae or the toxins produced by them are not among the contaminants covered by federal regulations. Oregon, though, has adopted “provisional health-based guidelines” for the things in drinking water. When concentrations above certain levels are detected, Oregon says officials have up to 10 days before issuing a warning. So clearly this is not usually an occasion for panic. And Salem wasn’t wrong not to issue an alert right away. — If Detroit Lake has an outbreak of cyanobacteria, what keeps Green Peter and Foster reservoirs on the South Santiam from having the same problem? Those “blooms” usually occur in warm, still water saturated with nutrients like phosphate and nitrogen, the Oregon Health Authority says. You’d think that Foster, especially, is just as susceptible to this problem as Detroit Lake. Questioning government behavior and challenging authority is simply not allowed. It results in ad hominems and gets you labeled “anti-government.” You simply do not “love” the city like those in city hall do. I’m not certain I understand the complaint. Folks who I’ve in Albany generally expect their city bureaucracy to perform certain functions and provide services like police, fire, water, etc. There are many other cities to choose from, and also numerous private water systems in Linn County. Oh, and the option that tens of thousands of people select is to operate a private well. Roof catchment is also legal in Oregon. It seems to me we all get to choose. How true, how true, Mr. Shadle. None of us who open our mouths with an opinion contrary to theirs “love” Albany as much as Konopa and crew!! Hogwash, I say! Gordon is right. How much money do we give the government and time-and-time again they just can’t seem to get the most basic things right (like communication). Exactly what failed in communication by Albany around this issue? This is a nice reminder to stock up on some bottled water just in case. Did I mention Albany, Ray? I was talking about Salem’s screw up and government in general. Good lord. GS rails at the Albany gummint over something that happened elsewhere, and others pile on and agree. Reality check — the article refers to due-diligance testing (feed and product streams).